On my walk this morning I saw this peacock in front and two ladies trying to get in their house and Spinnaker. I called animal control to find out what to do. 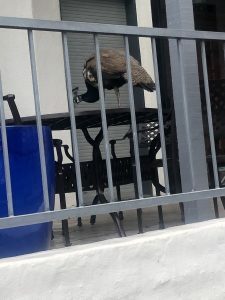 They told me that there are four peacocks loose and they tried to catch him for four months without success. They said since they have survived and are taking care of them selves to just leave them alone. It is now against the law if you touch them and they will not hurt you.